Mrs. Spensley was born at Brierley, in the Barnsley Second Circuit, in the year 1833. When but a child she was the subject of deep religious impressions. It was not, however, until she was 16 or 17 years of age that she gave herself to the Saviour, and joined the Church. From that time she became one of the most ardent workers in connection with our Brierley Society. She took a great interest in visiting the sick, collecting for the missions, and was a most regular attender at all the services of the Church. A number of ministers and others remember with what earnestness and power she usually prayed at the Sunday evening prayer-meetings. 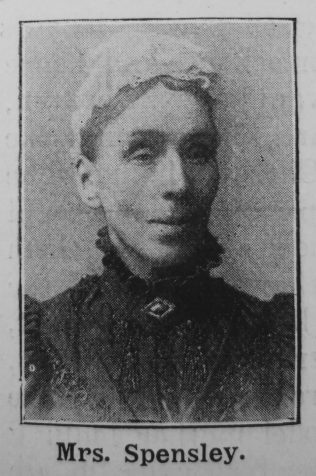 By her generosity, hearty and helpful service she was one of the principal agents, under the Divine blessing, in making the Brierley Society one of the best in the Barnsley Circuit. In July, 1866, she was married to the Rev. John Spensley, and during all the years of their married life was a true helpmeet to him. With a quiet, unobtrusive vigour she nobly supported the work of her husband. In all their Circuits she rendered splendid service, and always enjoyed the confidence and esteem of the people. The poor and the afflicted found in her a friend. She was hospitable and kind to all who entered her house. Mrs. Spensley excelled in the domestic sphere. She was orderly and methodical in all her household affairs. Her house was a model of cleanliness and order. She was generous, and adopted the principle of systematic giving. She was scrupulously careful to give that which she had set apart for the Lord. Our sister greatly enjoyed the class meeting and week night preaching services. She was an earnest Christian woman, a good wife, and a devoted mother. Our friend’s life was not exempt from trial and sorrow. Some years ago a dark cloud came over her home. Their only daughter, a fine, sweet girl of great promise, sickened and died. And though our sister was resigned to the Divine Will, yet the trying discipline seemed to take, for a time, considerable brightness out of her life. It was apparent to Mrs. Spensley’s friends that she was in failing health, but they did not entertain the thought that her end was so near. Her death was somewhat sudden. It took place at North Cave on December 6th, 1899. On the morning of the previous day she was seized with a fit of apoplexy, which, from its severity, gave no hope of recovery. All that kindness and medical skill could do were of no avail. She was ready when the Master called her. In death, as in life, she was bright and peaceful. Her mortal remains were laid to rest near those of her daughter, in Felkirk Churchyard, amid tokens of deepest sorrow, where they peacefully await the resurrection morn. The writer improved her death in the Buckley Street Chapel, Barnsley, to a large congregation. Whose God was thy ransom, thy Guardian, and Guide. Jane was baptised on 22 September 1833 at Felkirk, Yorkshire. Her parents were William, a farmer (of 11 acres in 1851) and gardener, and Mary. Jane worked as a dress maker before her marriage. Jane married John Spensley (1839-1925) in July 1866 at Hemsworth, Yorkshire. Census returns identify two children.